Connective tissue is a fibrous tissue in animals that forms the body’s infrastructure by supporting or joining other tissues together, such as connecting muscles to bone or skin. It is one of the four types of tissue in traditional classifications (the others being epithelial, muscle, and nervous tissue). The cells of connective tissue secrete a number of products externally forming what is called the extracellular matrix. The various connective tissues are distinct and classified based upon the characteristics of its extracellular matrix. The four basic types are: connective tissue proper, cartilage, bone, and blood. The cells are all somewhat far apart with a great deal of extracellular material between them. The matrix contains a mixture of chemicals referred to as the ground substance. The ground substance is composed of special proteins that the cells secrete to attract water. This accumulation of water makes the ground substance gel-like. Many of the cells in connective tissue also secrete proteins that form fibers called protein threads. Collagen is an example of a protein fiber that aids in holding connective tissue together, making it firm.. 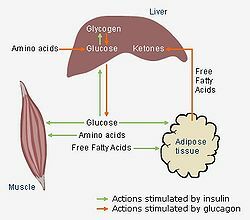 This image illustrates the role adipose tissue plays in connection with muscle and liver in the process of storing and utilizing the energy of fatty acids. Loose connective tissue proper is characterized by its gel-like ground substance. It is composed of proteins, including collagen; some fluid; and elastic fibers. All of the components which form the extracellular matrix of loose connective tissue proper are produced by the cells. The cells that specifically make up connective tissue are called fibroblasts. Technically, these cells are only called fibroblasts while the tissue is developing. Once the fibroblasts are fully mature, displayed by being completely surrounded by the matrix, they are called fibrocytes. The task of light connective tissue is to form a light binding. It is not extremely strong, but instead highly flexible. This lets the connective tissue hold things together in all directions, but very subtly. The most recognizable function of loose connective tissue is to connect the skin to the underlying muscle. In layman’s terms, adipose tissue is referred to as fatty tissue. It contains the components of loose connective tissue fluids and proteins such as collagen and elastic fibers, with the addition of fat cells. The functions of adipose tissue include providing insulation and storing energy. There are two types: white adipose tissue and brown adipose tissue. White adipose tissue provides heat insulation, mechanical cushioning, and a source of energy. More energy can be stored per gram of fat than in either carbohydrates or proteins. Therefore, storing energy as fat is the most space-efficient form of energy storage in the body. Brown adipose tissue releases stored energy directly as heat. Interestingly though, it is not typically found in adult humans. Because fat is so effective at insulating and producing heat, it is healthy to have fat; as long as it is in the proper quantity in relation to a person’s mass. 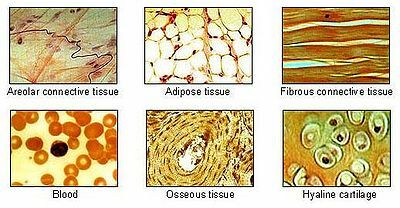 Adipose tissue can be found serving as a cushion surrounding organs such as the kidneys, and as insulation in places such as under the skin. This image depicts the abundance of connective tissue present in the knee joint, including cartilage, ligaments, and tendons. Dense irregular connective tissue is called such because of its abundance of collagen fibers. In comparison to loose connective tissue, it has significantly more collagen fibers than the former. The term “irregular” in the name simply states that the fibers are oriented in assorted directions. Because of this, it has strength in all directions. Because of its durability, dense irregular connective tissue is found in a multitude of places in the body. It forms capsules around organs such as kidneys. It is also found in the dermis, giving skin the tough durability that is required to make it an effective shield for the body. Like dense irregular connective tissue, dense regular connective tissue has a plentitude of collagen fibers and fewer cells in comparison to the loose connective tissue. Unlike dense irregular connective tissue, however, dense regular connective tissue has collagen fibers which all line up in the same direction. This tissue also holds no elastic protein fibers, which is appropriate for its purpose. Dense regular connective tissue has what is referred to as tensile strength, like that found in a rope. It has great strength on a single plane. Because of its tensile strength, this tissue is perfect for attaching parallel components such as muscle to muscle, or muscle to bone. Therefore, dense regular connective tissue makes up elements of the body such as tendons and ligaments. It is a common practice for people to pierce the elastic cartilage of their ears as ornamentation. 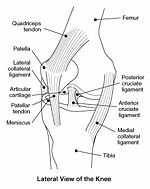 Cartilage is a tough, elastic, and flexible type of connective tissue. The ground substance of cartilage is composed primarily of chondroitin. Its extracellular material is produced by chondrocytes, or mature cartilage cells. These cells are too large to directly inhabit the matrix. Instead, they reside in hollow spaces in the ground substance called lacuna. Another unusual characteristic of cartilage in comparison to other connective tissues is it is avascular, meaning that it lacks blood vessels. This is an issue because the chondrocytes are still living cells and require oxygen and other nutrients to function. Therefore, the elements necessary for the cells' survival must diffuse through the matrix. For this reason, the extracellular matrix cannot be very thick. Regardless, cartilage is very strong and durable to withstand arduous circumstances. Hyaline cartilage matrix is composed primarily of collagen. Under a microscope, the collagen is difficult to see because it has the same optical density as the fibers in the ground substance. The purpose of hyaline cartilage is to act as a resilient force. The collagen in the cartilage gives it its firm, plastic-like quality. This can be observed in the bridge of the nose. The firm, thin sheet that divides the two nostrils is composed of hyaline cartilage. In addition to acting as a supporting structure hyaline cartilage also reduces friction at joints, and is involved in the longitudinal growth of bones. It makes up the costal cartilage with connects the ribs to the sternum. It forms caps on bones in joints, allowing bone to move on bone without causing friction. Rings in the windpipes, composed of hyaline cartilage, assist in keeping the trachea and bronchi open. Finally, hyaline cartilage is present on the ends of bones. In time, the cartilage is replaced by bone, increasing the longitudinal length of the bone. Elastic cartilage contains less collagen than the other two forms of cartilage; however it contains an abundance of elastic fibers. These fibers appear as dark chords when observed under a microscope, making elastic cartilage easily distinguishable. The fibers also allow the cartilage to perform its function of acting as flexible support. Concerning the outer ear, elastic fiber helps the ear maintain its shape while being flexible. The situation is similar with the rubbery end of the nose. 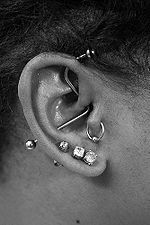 Some people choose to ornament themselves by piercing the elastic cartilage of their ears and/ or nose. Fibrocartilage is composed of many layers of collagen fibers lying parallel to one another. This makes the cartilage extremely dense. However, it also contains gaps in the lacuna because not all of the cells require the protection of such housing. This gives it a spongy quality. Fibrocartilage amalgamation of density and sponginess makes it binding yet resilient. Fibrocartilage often acts as a shock absorber. In the joints of the backbone, it gives tough binding while providing dependable cushioning. In some cases, however, the fibrocartilage between joints will give way; this is called slipping a disk. Diagram of the spongy and compact layers of the bone. Bone, technically regarded as osseous tissue, is composed, like all connective tissue, primarily of collagen, but also contains glycoproteins and an impressive amount of calcium. Also, unlike other forms of connective tissue, the ground substance in bone hardens through a process called calcification. Because of its hard composition, osseous tissue’s main functions are to provide support and protect other tissues, act as a place of storage, and perform hematopoiesis (the process of forming blood cells). Osseous tissue is divided up into two types: spongy bone and compact bone. Both forms perform significant roles in connecting all of the divisions of the body. The skeletal system is the basic supporting structure of the body. Bones connect to other bones and muscles through ligaments and tendons which, as aforementioned, are composed of dense regular connective tissue. Blood, technically called vascular tissue, fits all the same criteria as the other connective tissues. It has cells (red and white blood cells), a ground substance (the proteins in blood), and fluid (blood plasma). During blood clotting, blood even forms fibers. The main function of vascular tissue is to transport oxygen, carbon dioxide, nutrients, wastes, hormones, and other numerous elements to and from the body’s cells. Blood is able to carry oxygen, its most important passenger, on erythrocytes (red blood cells) which contain hemoglobin that binds to the oxygen. Leukocytes (white blood cells) in the vascular tissue aid the immune system. Blood also contains blood platelets which form blood clots in response to a cut. ↑ 1.0 1.1 Connective Tissue by Professor Raymond Coleman, Technion-Israel Institute of Technology. ↑ Adipose Tissue by Ann L. Albright and Judith S. Stern, Department of Nutrition and Internal Medicine, University of California at Davis. ↑ 11.0 11.1 11.2 11.3 Cartilage by Dr. Harry K. Wong, The Department of Biodiversity & Conservation Biology, The University of the Western Cape. ↑ Osseous Tissue by Dr. Hugo Rodriguez, Department of Biological Sciences, University of Texas Brownsville. ↑ Connective Tissue by Andrei G. Gunin, Histology for Medical Students. This page was last modified on 9 April 2018, at 17:28.